URI is proud to have so many distinguished alumni with exciting careers. Nikki Noya, URI class of 2000, is no exception. Noya is the co-host of the travel television talk show “The Jet Set,”, the first hybrid talk and travel show. The shows airs on network (e.g., ABC, NBC, & CBS) and cable channels (e.g., Fox, The CW) throughout the United States. (see Where to Watch). The show works to reinvent travel television to help all different types of travelers experience destinations around the world right at home. After graduating from URI in 2000 with bachelor’s degrees in communication and journalism, Noya moved to New York City to begin her adventure. She had a number of different jobs leading up to her position of co-host on “The Jet Set,” and she even went back to school to become a personal trainer. Soon after, Noya began doing various fitness segments on television shows. 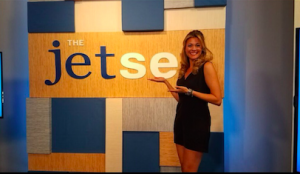 Two friends, Gailen David and Bobby Laurie, were starting the travel television show “The Jet Set”, and they asked Noya if she could do fitness segments on the show. Fast forward to a year later, and Noya is now one of the co-hosts of the show. Noya has found her dream job. She loves exploring new places and working with her amazing team. They work toward the same goals and act just like a family. Noya thanks Dr. Doody for her mentorship throughout her time at URI. Dr. Doody’s classes taught Noya to be fearless, take risks, and go for what she wants.